What does a child s life-threatening illness cost the neighbors of Cedar Circle? What joys can be hidden in life s greatest tragedies? Behind brightly lit windows and on front porches, marriages are tested and mended, hearts broken, hopes resurrected, dreams released and reformed, values and futures shaped, and faith rekindled or found for the first time. Taking the best and worst of human circumstances the tender moments, the laughter, the tragedies, and the triumphs Beverly LaHaye and Terri Blackstock weave from them a poignant, warmly human novel. Gently uncovering the inner struggles, stresses, and joys that surface among neighbors living on a quiet cul-de-sac, the authors show us the power of ordinary lives being knit into a strong, many-textured fabric of family and friendships." 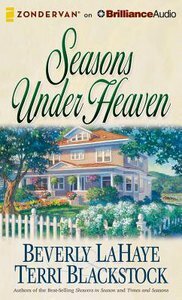 About "Seasons Under Heaven (Unabridged, 9 CDS) (#01 in Cedar Circle Seasons Audio Series)"
Order now to secure your copy when our stock arrives. Other edition is available. 9781501222900 0 Available. Expected to ship in 5 to 6 weeks from Australia.